Oh my aching head. 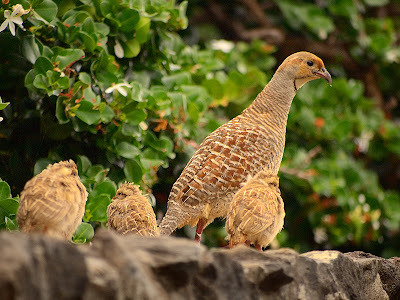 A Gray Francolin likes to perch on the fence post outside my bedroom window in the morning and repeatedly screech its call. It sounds like a rusty swing going tee-tar . . . tee-tar . . . tee-tar . . . on and on but getting progressively louder with each swing. Please Stop. And now there are babies . . . nooooooo. My pounding head did find some respite while I contemplated one of the Grand Wailea's many waterfalls this morning. I'm thinking I'd rather have that than the roosters my neighbors have that make noise all day long. 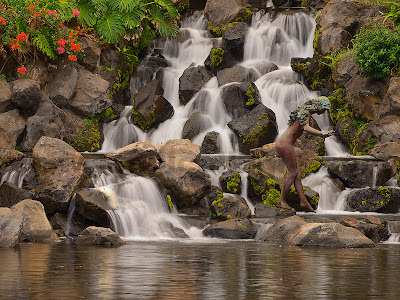 I just realized there is a naked person in that waterfall! Yes, Haley, strangely enough I did not notice her while sitting there. It wasn't until I had the photo on my computer that I saw her. I almost agree, Sandy. Roosters start while it is still dark out, which is not acceptable; but at least they don't perch right outside my window.